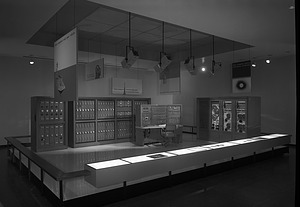 The National Museum of American History, known as the National Museum of History and Technology until 1980, was established in 1957 to house the growing US National Museum’s collections on the social, cultural, scientific, and technological history of the United States. The new museum opened in January of 1964. 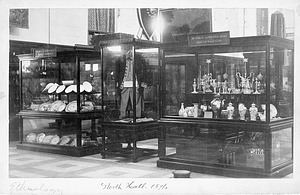 The relics of George Washington on exhibit as part of the Ethnology exhibit in the North Hall of the United States National Museum, 1891 (now the Arts and Industries Building). Washington's relics were one of the earliest collections of the United States National Museum. The First Ladies Hall was housed in the Arts & Industries Building from 1912 until it moved in the 1960's to the Museum of History and Technology, now the National Museum of American History. 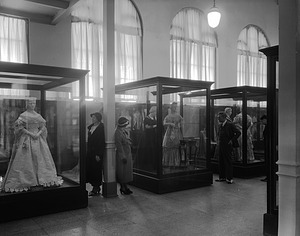 From 1912 until 1955 the gowns were displayed in cases, as seen here in the 1920's. After 1955 gowns were displayed in room settings. Exhibit cases of First Ladies Gowns were probably in the northwest range of the Arts and Industries Building. A woman is looking in the case to the left at the dress of Harriet Lane Johnston, niece of President James Buchanan. A woman and a man are looking in the case to the right which contains the dress of Jane Appleton Pierce (left), wife of President Franklin Pierce, and a dress of Abigail Powers Fillmore (right), wife of President Millard Fillmore. 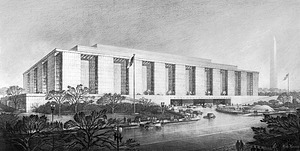 An architectural rendering of the exterior of the Museum of History and Technology, now the National Museum of American History (NMAH), shows people and cars and the Constitution Street entrance. 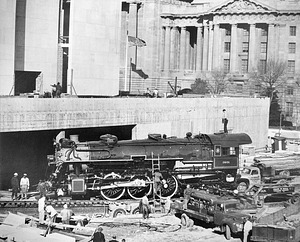 The 1401, a 280 ton Pacific-type passenger steam locomotive shown being moved into the National Museum of History and Technology (NMHT), now the National Museum of American History (NMAH), while the building is still under construction. The locomotive is sitting just outside the building, attached to a pulley system, being readied to be moved in. 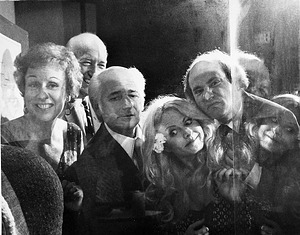 There are several people standing in the foreground, background and right side of the photograph. The locomotive was built in 1926 by the Richmond, Virginia, works of the American Locomotive Company. The front center of the Department of Commerce Building can be seen on the right. 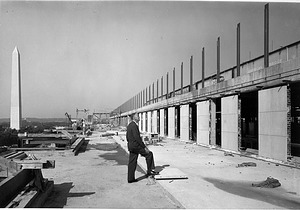 Frank A. Taylor, founding Director of the National Museum of History and Technology (now the National Museum of American History), inspects the History and Technology Building as construction nears completion. He is standing on the fifth floor terrace. The Washington Monument and National Mall are visible in the left background. 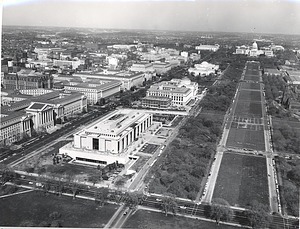 Aerial photo from the Washington Monument showing the newly completed Museum of History and Technology, now the National Museum of American History, the construction of the West Wing of the Natural History Building, The National Mall, Constitution Avenue, the Capitol in the distance, and the Smithsonian Institution Building on the right. At the National Museum of History and Technology, now the National Museum of American History, Curator Silvio Bedini stands behind visitors viewing the Eleanor and Mabel Van Alstyne American Folk Art Collection. The inscription on the image's negative sleeve reads: "Tour conducted by Mr. Bedini for the children of the White House." 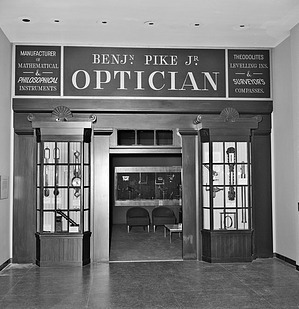 A reproduction of the facade of a 19th century instrument shop of Benjamin Pike of New York City in the Hall of Physical Sciences. Many of his instruments are on display in the windows. 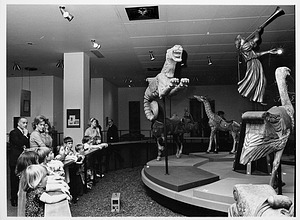 The exhibit opened in March 1966 in the Museum of History and Technology, now the National Museum of American History. 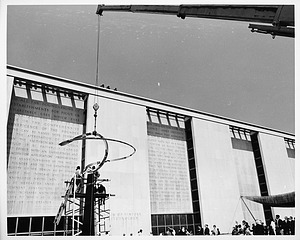 Installation of the Infinity sculpture on the National Mall side of the Museum of History and Technology, now the National Museum of American History. ATLAS Computer Exhibit displayed in the National Museum of History and Technology (NMHT), now the National Museum of American History (NMAH). The Atlas Computer, developed at the University of Manchester, England, was at the time the fastest computer, using germanium transistors. 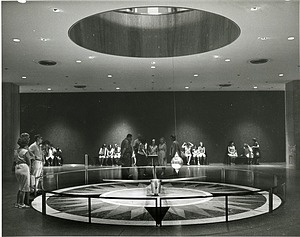 Visitors on the lower level of the National Museum of History and Technology, now the National Museum of American History, are watching Foucault's Pendulum, which demonstrates the rotation of the earth. 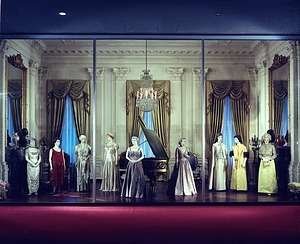 View of one of the exhibits in the First Ladies Hall, National Museum of History and Technology, now the National Museum of American History, featuring at far right the addition of the gown of First Lady Mrs. Patricia Nixon. The following are also pictured from left to right: Florence King Harding, Grace Goodhue Coolidge, Lou Henry Hoover, Eleanor Roosevelt, Bess Wallace Truman, Mamie Dowd Eisenhower, Jackqueline Bouvier Kennedy, and Claudia (Lady Bird) Taylor Johnson. Maryann Belardo is pictured looking through records in the Archives Center's stack area of the National Museum of American History. 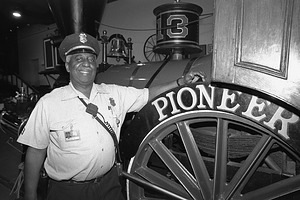 In National Museum of American History's Railroad Hall, Robert "Railroad" Harris of the Guard Force stands beside a train engine that has the name "Pioneer" on one of its wheels. An early passenger locomotive, the "Pioneer," was built in 1851 for the Cumberland Valley Railroad Company of central Pennsylvania. 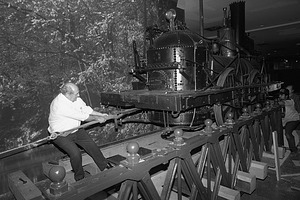 National Museum of American History Museum Specialist John Stine struggling to move the 12-ton John Bull locomotive to a new spot thirty feet away from its previous location on the second floor, March 6, 1986.